This leads us into the wider conversation as to why, despite having a significantly enlarged entry this year (a 36 per cent increase on the 60 books submitted in 2012) we received disproportionately fewer from women, of which many were technically fantasy. And Tom Pollock saliently points out: "so what if they’re fantasy, why should that stop them from being SF as well?" It's no surprise that the Clarke Awards would lean toward this definition to mean "hard science fiction", or "focused on extrapolation of a scientific principle or concept", or at least "in the spirit of Arthur C Clarke" books, but where do we draw the line in fantasy elements? 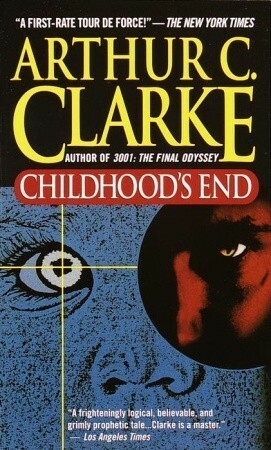 One of Clarke's best-known novels is Childhood's End, where aliens which resemble bat-winged demons basically take over Earth and uplift humanity, then watch with interest as the new humans evolve into a telepathic hive-mind. The story culminates with Earth dissolving into light. Now, I call my Touchstone Trilogy "science fantasy", primarily because it features worldgates and "psychic space ninjas". And it's full of my extrapolations of nanotech and a 'connected' society. I think of And All the Stars as science fantasy too, though I don't think there are any more fantasy elements in it than in Childhood's End. But I don't think it's focused enough on a scientific principle or concept, being more caught up in questions of friendship. Champion of the Rose, however, is. 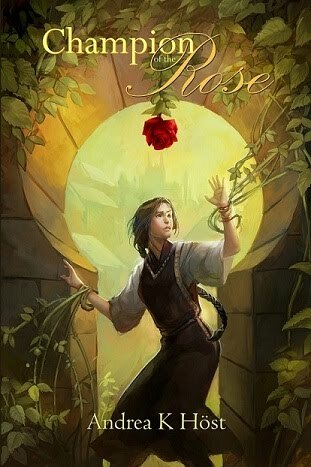 I've only seen one review which mentions that Champion of the Rose reads as science fiction. I mean, it has tons of magic, and Actual Gods, and a possessive rose bush, but it's fundamentally a Genetic Manipulation Gone Horribly Wrong story. The race called the Fair in Champ uses magic to create genetically modified plants and animals - alterations they term "beyond the blood". It's strongly indicated that their race probably became "the Fair" by modifying themselves, and they now have extremely strong laws forbidding genetic modification of any of their people - and the plot is driven by what is suggested is a genetically modified member of the Fair. It's in the worldbuilding that I do most of my extrapolation. There's little world hunger, because the Fair chose to gift the other races with several useful crops that keep most kingdoms above subsistence level. Food preservation is greatly enhanced by genetically modified cloves. There's easily available birth control. It's a book about how 'easy' genetic manipulation impacts on a pre-industrial world. Now, I don't think I ever went far enough with my extrapolation to make Champ an award-worthy novel (and I seriously doubt I qualify for the Clarke Awards, though I've no idea how self-published books which are merely 'available' in Britain count in these matters, and it would be several years too late anyway). But I'm a little saddened by the implication that many books among this year's possibilities (whether written by men or women) were automatically discounted by the judges as "technically fantasy". How much magic does it take to stop something from being science fiction? I think, as you say, the lines can be very blurry. That doesn't stop me having strong opinions though. I'm happy with psychic space ninjas existing in a science fiction universe and super powers are a very borderline thing. For me it's the other elements of Touchstone like the nano tech and medical technology (particularly the medical technology not relying on super powers) that keeps in in the science fiction box (although science fantasy is also a fair description). And I'd put And All The Stars firmly in the SF box. I can think of two other genre-bending series though which in my opinion tend to land in the "wrong" (in my opinion) box. Jennifer Fallon's Second Sons trilogy is set on a planet with two suns, no magic and the main character uses logic and learning to save the day/world. But because the culture is about as technologically developed as often found in fantasy books (ie not very), it gets called fantasy. Possibly the fact that her other series are more definitely fantasy also pushes it in that direction. Jo Anderton's Veiled Worlds duology has a very rigorously defined magic system with very firm rules and a steampunky setting that make it seem like a science fiction book. The only science in it is the study of the magic, so to me it's firmly fantasy. With the Clarke Award shotlist, without seeing a list of the books they rejected for being "technically fantasy" it's hard to judge just how strict they're being. I think a lot of people would be happier (or possibly more unhappy) if they released a list of books deemed ineligible on those grounds, in the name of transparency, but I doubt that will happen. By the way, I'm pretty sure I read somewhere that the Clarke Awards don't consider any self-published stuff at the moment. It's nice that the Aurealis Awards do. My go-to book for genre confusion is Cherryh's "Angel with the Sword". Absolutely a science fiction book, but reads like fantasy. Self-published books fall into a really weird place where awards are concerned, and most awards don't indicate one way or the other. The Aurealis can manage it mainly because "Australians" is a relatively small pool. It'll be interesting to see what happens if someone self-publishes a book universally acclaimed as a heartbreaking work of staggering genius, but "technically not eligible". I was very curious to see whether "Wool" would appear on any of the award lists, but I haven't seen it pop up anywhere. recommending that they look to the Cybils as an example of how to handle the mass of submissions. The Cybils go through a two-stage process. All the nominations are collated, and then split between several stage 1 panels for a first pass, and they create a short list which the stage 2 panel judges. You could tweak that just a little so that the stage 1 panel creates a long list, and then stage 2 creates first the short list, and then the finalists. That way one small group of people is not facing a read of several hundred books, but instead the top ten or twenty from each panel. A system like that sounds good. Glancing at some of the other controversy surrounding the Hugos and Nebulas makes me glad that there's at least some panel-judged awards to bring attention to good but not necessarily popular enough to win popularity awards books. Case in point, I probably wouldn't have heard of you (at least not at that time) if it wasn't for your first Aurealis shortlisting. See I don't think it occurred to me that CHAMPION was science fiction until I saw you post about it. And to some degree I think that's because of the type of 'fantasy' I read. Brandon Sanderson, for all that his books are almost held up as 'classic' examples of Epic Fantasy also include a lot about genetic manipulation (Warbreaker) or what happens when it goes wrong because of the 'Gods' as perceived by the people (Elantris). So in CHAMPION I just sort of shrugged and said, oh well that fits. By contrast I thought the Touchstone books--despite having a 'portal fantasy' start-up--were science fiction plain and simple. Same with And All the Stars. They more closely fit what I consider to be science fiction (aliens, advanced tech, tech in the brain, spaceships). That said the divisive line between the two is getting harder to qualify especially as people blend pieces of one genre into the other. Though I think Fantasy is blending quicker than Scifi (and some of this might be the influence of Steampunk and 'gaslight fantasy' on the genre). I can name half a dozen fantasy books that had echoes of scifi running around that came out in the last year, and maybe one Scifi with echoes of Fantasy (and 6 that were hard straight scifi magic need not apply). It seems like all the awards are getting flak one way or the other. The Hugos are getting a ton of backlash (though I'm given to understand this is the norm) for the lack of author diversity (not gender, just 'new' authors or non-North American in general). "Aliens" and "advanced tech" are so easily conflated with "elves" and "magic" that no hard and fast rule seems possible. 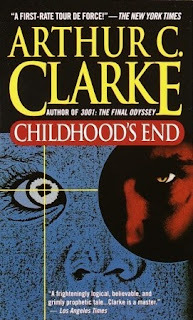 "Childhood's End" seems to be a primarily philosophical novel, and that philosophical point could easily still be made if you replaced "alien" with "djinn" and "telekinesis" with "magic". I did notice that Liz Williams' has clarified that (at least one of) the books disqualified was "vampire romance", so maybe they let more fantasy in than we realised. But who's to say that vampire romance wasn't making a philosophical point about human evolution? As I've said before, whether a book falls into science fiction and fantasy seems to depend on whether the characters get about on horses or in spaceships, no matter what the underpinning of the story may be. "How much magic does it take to stop something from being science fiction?" Star Wars has magic -- the Force. ERB's Barsoom series is science fantasy. Everything Ray Bradbury wrote is science fantasy.